New Delhi [India], Feb 23 (ANI):The multi-starrer ‘Total Dhamaal’, which opened to mixed response, earned Rs. 16.50 crore on the first day of its release. New Delhi [India], Feb 18 (ANI): Pulwama terror attack that killed around 40 Central Reserve Police Force (CRPF) personnel and injured several others has shaken the entire nation. New Delhi (India), Feb 5 (ANI): Yet another remix. The makers of ‘Total Dhamaal’ have released a new track titled ‘Mungda’, which is a remix version of 70s Inkaar song of the same name. New Delhi [India], Jan 29 (ANI): It’s the season of remakes! The makers of ‘Total Dhamaal’ dropped the first song titled ‘Paisa Yeh Paisa’ which is a rehashed version of the original track from Rishi Kapoor’s ‘Karz’. 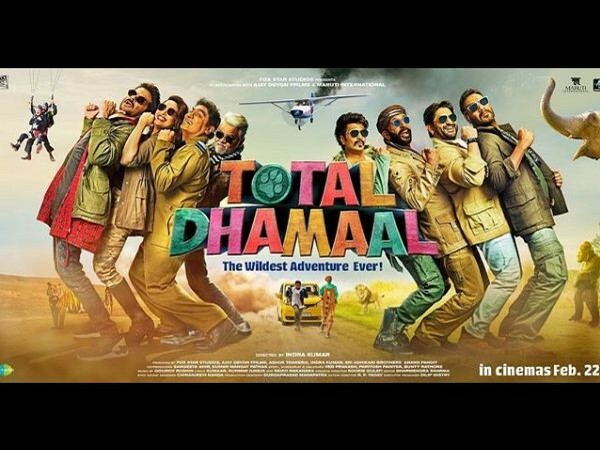 New Delhi [India], Jan 21 (ANI): The trailer of highly anticipated multi starrer film 'Total Dhamaal' if finally out and it seems like a perfectly put together Bollywood masala movie. New Delhi [India], Jan 18 (ANI): Mark your calendars because the 'Total Dhamaal' gang is finally here to take you on a journey of unlimited comedy.